Love the wall art, where is it from? Love the cabinetry / hutch / media unit. Where is is from? It's 3 separate sideboards that we have put together on one base plinth. It was from Habitat originally but unfortunately they no longer stock it. 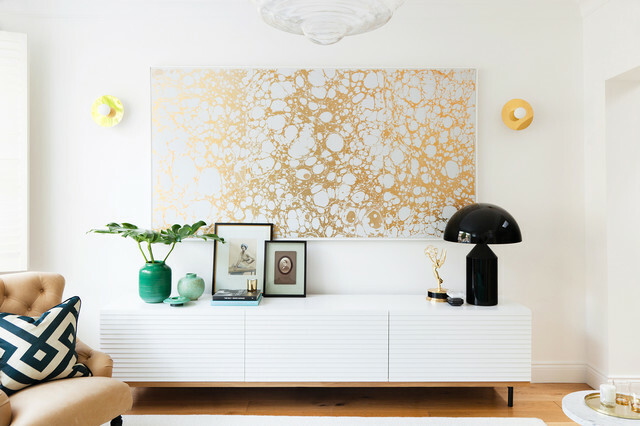 … or create a custom-made credenzaIf you’re struggling to find a piece with the right proportions, consider fashioning your own credenza for a contemporary nod to the era. This elegant (and economical) take on a mid-century sideboard is composed of three shop-bought cabinets mounted on a wooden plinth. Absolutely love this golden painting! A shoot for Interior Design Studio, Accouter.